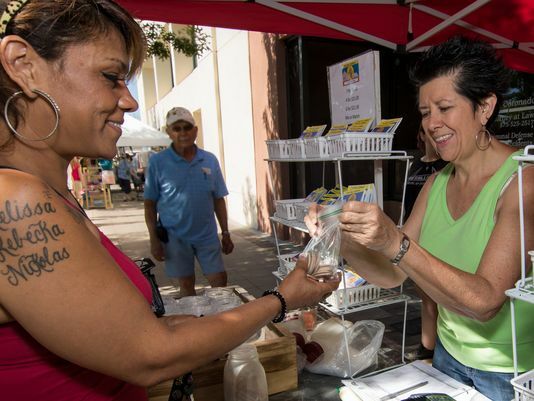 Karen Acosta-Lombino, a participant in the Double Up Food Bucks program, receives her bag of tokens from Brenda Mosely at the Las Cruces Farmers & Crafts Market. • Las Cruces Farmers & Crafts Market, 125 N Main St., 8:30 a.m. to 1 p.m. Wednesdays and Saturdays. Season is year-round. • Anthony Youth Farm Farmers Market, 1590 Hwy 478, Anthony, N.M. Noon to 4 p.m. Fridays. Season is year-round. • Ardovino’s Desert Crossing, 1 Ardovino’s Desert Crossing in Sunland Park. Summer hours: 7:30 a.m. to noon Saturdays. • Chaparral Farmers Market, 101 S. County Line Drive. From 7:30 to 11 a.m. Saturdays, July through Nov.12. Visit www.doubleupnm.org for more information. Are there none in Albuquerque or Edgewood? Do they still have the market in Bernalillo? I heard that they were no longer having it. Firstly, apologies as the late response…I was on vacation and only returned a day or two ago. 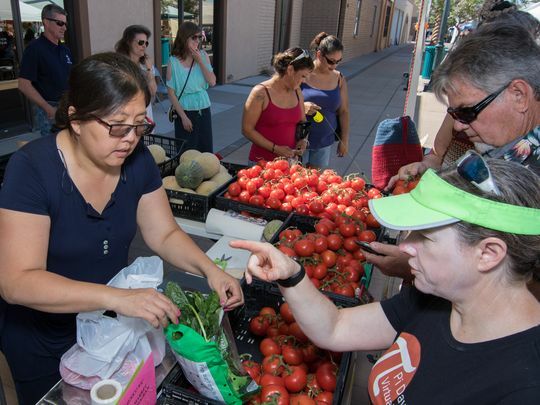 🙂 But, yes, there is a market in Bernalillo: Bernalillo Farmers’ Market is located at Camino and Caye Don Francisco (in the pavilion at Rotary Park). The market manager is Bonnie Hill (505-228-5801 or bwhillsha1@yahoo.com if you have any questions). The market is open until October 28th, on Fridays from 4 PM to 7 PM.